Some people came to the monks to be healed, but many others came to steal things from the monks. Being robbed so often became frustrating to the monks. Eventually the monks left that area and traveled to the island of Cyprus, to live there instead. The seas were terribly rough as they traveled, and their ship broke into two pieces! But Kendeas and the others walked on the water and arrived safely at the shore. Kendeas ended up in the Paphos region of Cyprus. Another monk, his friend Jonas, went on to Salamina. After a few years, Kendeas went to Salamina to visit his friend Jonas. Along the way, Kendeas found a cave near the village of Avgorou. He went inside the cave. He liked it so much that he promised God that he would stay there until he died. However, Kendeas was so hot that he knelt down on a rock inside the cave and prayed for water. He also prayed to see his friend Jonas. Two miracles happened because of his prayers: clear water began to pour from the rock, and a cloud full of light carried Jonas to Kendeas, to visit him! The two friends were so happy to see each other again, and they enjoyed talking together. After a while, the cloud took Jonas back to Salamina. The people in the neighborhood saw that water was coming from the rock in the cave. They knew that there had not been water coming from there before, and they wondered about it. They asked Kendeas how it got there. When they found out that his prayers were so powerful that he could pray and have water pour out of a rock, the people began to bring sick people to him so that he could pray for them and heal them! Kendeas lived in his cave for a long time. During the time that he lived there, there was a long stretch of time when there was no rain on Cyprus. When there’s not enough rain, we call it a “drought.” This drought on Cyprus went on for 17 years. Finally the people begged Kendeas to pray for rain. He told them all to go home! When they were home, he held his hands up in the air and began to pray for rain. Right away, clouds gathered, and it rained and rained! Kendeas did not like to be comfortable. You might have guessed this because he chose to live in a cave instead of a house. But there was something else that he did so that he would not be too comfortable. Beginning when he was a child, Kendeas did not sleep in a bed. He slept instead on the ground. One day when some of the people of Cyprus brought their sick family and friends to Kendeas to ask for his prayers for healing, they discovered that he had departed this life. His body was still there in his cave, and it smelled miraculously beautiful, like heavenly flowers. The people buried Kendeas right there in his cave. A church was built in the area of his cave after he died, and a monastery, too. Today, the nuns in the monastery continue St. Kendeas’ work of caring for the sick. The water from his miracle prayer still pours out of the stone in the cave. St. Kendeas’ miracle working did not stop when he died. He continues to pray for people, and God hears his prayers and heals them. He also often appears to people. Many people who live in the area have seen him, especially the nuns who live in the monastery. But the people who meet him are not afraid, even if they do not know who he is. He is so friendly, that if people meet him who do not know him, he just introduces himself! 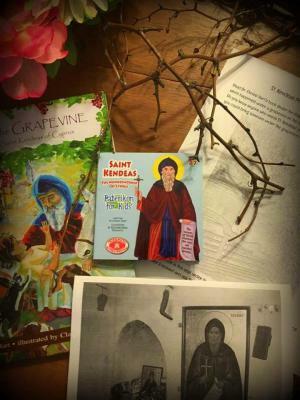 St. Kendeas is celebrated on October 6/19. Holy St. Kendeas, please pray for our salvation! If your class studies the life of St. Kendeas, you may want to invite each student to think of someone who they know who would benefit from a visit with the saint. Let each student draw/write about the person on this printable pdf. Take some time to pray and ask St. Kendeas to pray for those friends and family members. Students of all ages will enjoy hearing this recent account of another miracle through the prayers of St. Kendeas: http://www.chrissihart.co... Glory to God in His saints!